The world consumes over 2.3 billion cups of coffee every day. Coffee is the most traded commodity in the US, and its popularity is continuing to grow on markets like the UK, China and Japan. 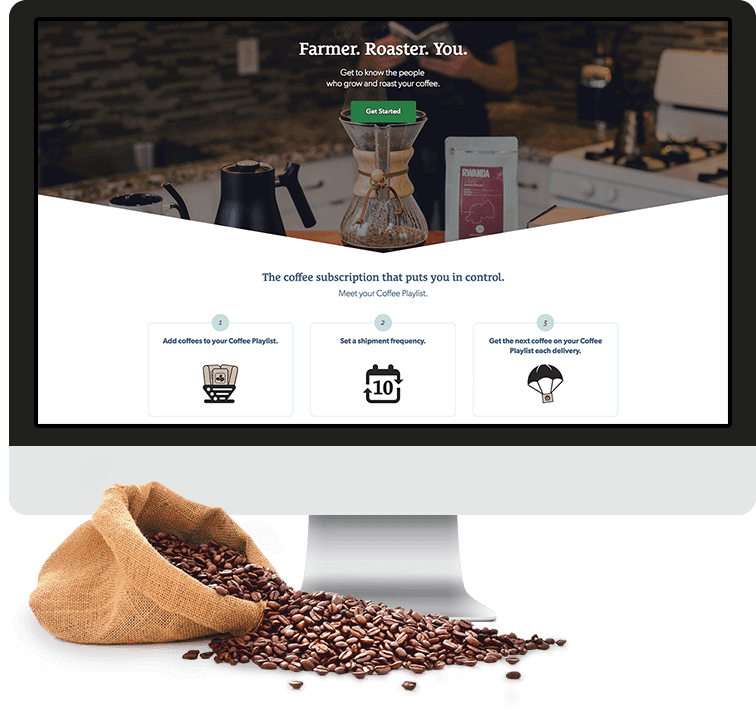 You can enter the coffee market by creating a Magento, WooCommerce or Shopify store selling custom roasted beans, ground coffee, or even coffee machines and mugs. Read further to discover how to build an online coffee store and how much it might cost. 9 cups of coffee were consumed while working on this article. You will definitely need to find a supplier to provide ingredients for your coffee business. There are many available suppliers to consider, like coffee wholesalers, distributors, manufacturers, etc. 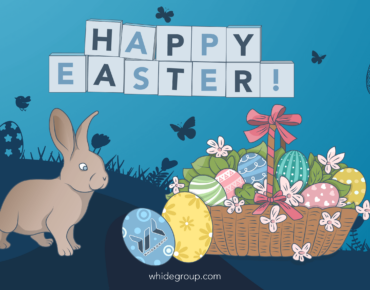 You can choose the dropshipping model cooperating with wholesalers and manufacturers where they keep the coffee in the warehouse, and when customers make a purchase from you, the wholesaler/manufacturer will pick and pack each order. This saves you a lot of time, allowing you to focus on the management and marketing for your business. 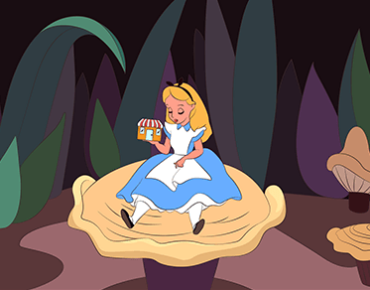 Next, think about your further production capacity, geographic limitations, and dropshipping costs. Define the production capability of your coffee business and work with a supplier who will be able to meet your production needs on time. Along this line, search for the dropshipper who covers your geographic area and has the best prices to offer. When all the preparation steps are done, it’s time to look at some examples of successful businesses that sell coffee online. What do they have in common? We researched their websites and found out that they have high quality coffee roasters/suppliers, an established and well-managed logistic network, a convenient website and a highly qualified subscription service for their clients. Do you want to look at these stores yourself? It is a small business supporting other small businesses (and they’re proud of it!). Today, MistoBox’s network includes 40 roasters with more than 600 coffee grades and uses a marketplace business model. In other words, it matches the most professional roasters with consumers who would be glad to subscribe to high-quality coffee. How it works: a specially trained helper first starts with a short survey to find out customer preferences for coffee. For example, if you have specific or conservative taste preferences, go for light roast or dark, single-origin beans or blends. Based on the customer’s answers, this curator (matchmaker) selects and sends a 12-ounce bag of coffee that he or she thinks you will prefer the most. The customer selects a shipping plan, and the coffee arrives in a chosen period of time (you can get coffee as often as you wish, from every 10 days to every month). UX: The website has been redesigned and upgraded. Now it continues to evolve and will soon make customer coffee reviews available to guide other customers in their search. MistoBox’s website is easy to navigate, with a light design allowing the user to concentrate on services promoted by the company. It also provides an easy-to-choose shipping frequency. For convenience, coffees are listed alphabetically, with pictures of the various flavors in each one (fruits or other foods). Once you have ordered your first shipment, the support team will contact you to notify you about the order details, or you can create a personal account and see the information there. Crema.co is a coffee subscription service that states: “Coffee is a community, not a commodity”. An interesting feature of the company is that it works only with small-batch roasters from different corners of the Earth and tells the story behind every coffee producer on their website. How it works: In the beginning, there is a survey that will provide users with a personalized experience. One option is to ask a coffee curator for help. Another is to search for different coffee grades by the roast level, geography, or certification. Have you heard about the Brewlist? After tasting various coffees from different regions and roasters, subscribers can create their own list of preferences or “brew lists”. Customers can also choose the frequency of coffee delivery (from five days to one month). Subscription price varies from $16 to $22.50. UX: Users’ Brewlists on the website are easily accessible, and they can enable or disable delivery of the coffee at any time. The customer will also get an email notification when their favorite coffee is running out, when it’s out of stock, or when a new one is available. The Crema website offers a nice, clean, modern look that appeals to coffee lovers. The main menu is well-organized, allowing users to easily find coffee, roasters, or to even buy your favorite coffee lover a gift. Angels’ Cup is a coffee subscription box focused on single origin coffee from top-quality roasters. 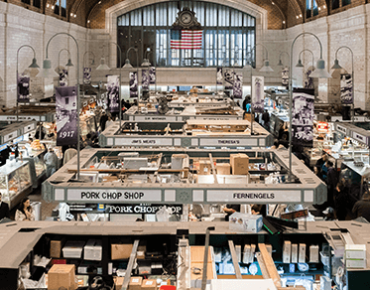 Freshness is a priority for this business, so they ensure a 24-hour manufacturing process (receiving the roasted beans, packing them, and shipping them to customers). How it works: Angles’ Cup subscribers have the option to order a bag of coffee, but the service tries to upsell their sample packages. After, subscribers typically select the regularity that they will receive their coffee (from weekly to monthly). Every month customers get their package with four various coffee grades. Angels’ Cup tries to keep the mystery, so the service marks each coffee bag with a number. 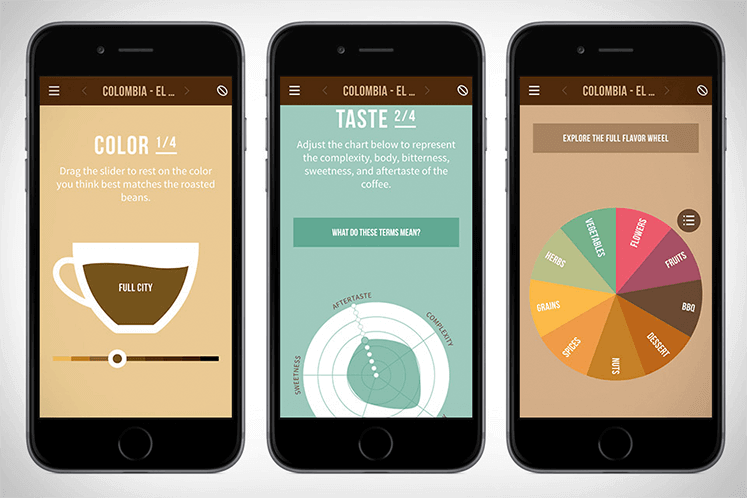 It allows subscribers to taste coffee blindly and then guess the coffee grades’ notes and names. Roasters and coffee ingredients are mentioned on cards that accompany the coffee. UX: Angels’ Cup’s website is easy to navigate, interactive, and the subscription service is simple. It also has a mobile application that helps customers (which is especially useful for beginners) to define their taste preferences. This app also has the advanced option for blind coffee tasting. The strongest part of the Angels’ Cup user experience is that subscribers can give their assessments for purchased coffee in the app. Further, customers can go right to the website and see previous purchases. Coffee roast parameters are available on the application too. What Technology Stacks Do Online Coffee Stores Use? We’re convinced that a properly developed website is not just the icing on the cake, but actually the cake itself. It is the biggest opportunity to deliver a positive user experience, because clear navigation, understandable interface and additional features (like the Brewlist and user reviews) will not only attract customers but keep them your customers as well. To develop such a website, let’s learn more about the technologies that were implemented. PayPal. Your customers should feel confident about the payment system they’re using, so you should сhoose very carefully. There are various payment systems available, and when we think about the most secure and reliable payment system for the website, PayPal is the first thing that comes to our mind. The most important feature of PayPal is the provision of security guarantees both the buyer and seller. Stock Inventory Manager. This Magento module was developed to deliver a positive stock inventory management experience. 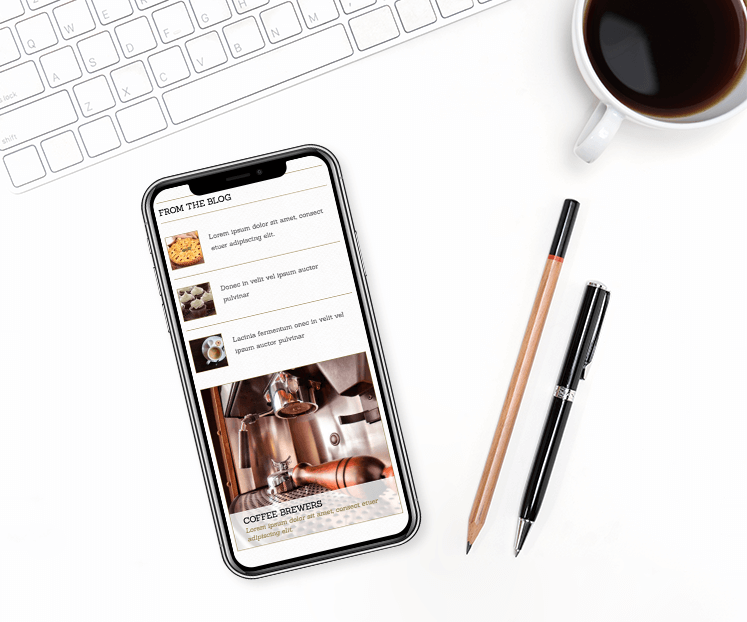 It will help you run your online coffee store effectively since it has editable fields that allow you to update bulk products, as well as a search line, in-grid stock management, and many other helpful tools. Instagram. This social network is created for distribution of beautiful pictures. Instagram is a powerful tool in the context of your online coffee shop development. By integrating with Instagram, you can let your customers share amazing images of what they made from the coffee they’ve got from you. You can include them further in the coffee experience by sharing these pics on your website which will help in increasing your website’s conversion, and customer loyalty. Google Analytics Enhanced Ecommerce. This analytic tool will help you to analyze the reasons why your potential customers leave the website. It also allows you to better understand customer behavior on your website and use this knowledge to make changes there, do remarketing and improve conversions. You will get useful reports such as checkout, shopping behavior, sales performance reports, and more. Xero. Your business requires a lot of space for data storage (there is plenty of information you will need to maintain, like e-mails, databases, important documents, etc.) There are many CRM/ERP solutions that are aimed at helping you. If you have cloud-based accounting software Xero, this extension will connect the data from your website to your Xero account. It happens automatically and quickly, so you won’t lose any important information. Further, you can track your sales, get financial reporting, and access many control functions. How Much Does It Cost to Build an Online Coffee Store? We can all lack resources as time, money, or tech skills. Yet, none should be an obstacle that prevents you from starting an online business. While “time” and “money” are more obvious, what can you do about “tech skills”? Are they important? If you plan to build your website on platforms such as WooCommerce or Shopify, you require less technical skills and, eventually, less time and money. This is an ideal option for beginners in the coffee business who are trying to understand their needs, as well as for those who have small to medium sales volumes. Another option is the development of your coffee shop with Magento. It is the best option for medium to large businesses who need more stalwart tools, such as pre-installed hostings, many responsive templates for themes and design, robust security, or SEO-friendliness. “How much does the coffee website development cost?” is a very general question. Let’s break it down and specify the criteria for the website development. To develop a website from scratch, a professional team of programmers will carefully go through all the development process, starting with gathering all requirements, and analysis, design stage, back- and front-end development, live server setup, and website deployment. 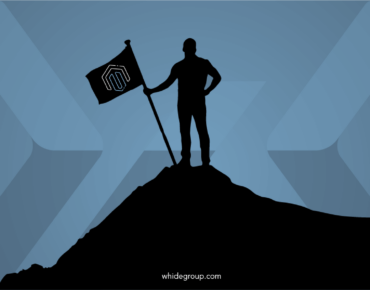 Below you can see the estimated hours for our Whidegroup team to complete this process. The next question usually covers rates. Rates tend to vary from region to region. Prices for website development are higher in the US, Western Europe, Canada and Australia, while you can find them lower in Eastern Europe and Asia. If prices for the development service are too high in your country, you can make use of a dedicated development team from an outsourcing company. It will prevent you from unwanted expenses on the development. However, remain aware of the quality of development and do not merely search for the lowest price: choose the best choice for your budget, timeframe and desired tech skills. A clear business concept and appealing to the target audience. Business starts with an idea. Make it visible, come up with the concept of your future online coffee shop. If you have doubts about what it should look like, imagine your target audience. To whom should your business speak? Keep this concept both in your online and offline stores (in case you have them). You coffee shop design should match the tastes of your target audience. You can also tell the story of your brand, much like Second Cup Coffee Co has done. Light minimalistic or bright catching colors. When people imagine a perfect coffee website, they think that a lot of beans, bags and cups should appear, and everything should look warm and brown. To some extent it’s true, but it’s better not to overload your design with lots of “coffee illustrations” as not to make everything in one boring color scheme. Consider using complementing colors; choose a minimalistic style like guys from Urban Coffee did, or vice versa – choose bright and catchy colors. Dunkin’ Donuts is a good example. A couple of similar fonts. Use two or three fonts maximum on your website to make it more attractive and catch the eye of potential customers. You can pick one font that visually differentiates from the others. For example – use something extraordinary for titles, while using other fonts with a simpler look, but from the same family. Here are a few examples: plastic quality (Farnham and Benton Sans), related proportions (Futura and Garamond), a contrapuntal interplay (Century Old Style and Sweet Sans; Chaparral and Proxima Nova) etc. Quills Coffee looks nothing other than classy and professional. They’ve chosen Work Sans and Bebas Neue fonts because the successful combination of styles, colors, and sizes presents an excellent contrast. A flat, simple look for your coffee logo. Such a logo gives a modern feel to your website. First, think what should be displayed. Coffee cups or beans are very popular and this is, of course, not accidental. Your logo should be easily recognizable and directly reflect what your business is about. Then, make some sketches or ask a professional designer to implement your ideas. Here you can perhaps get inspired with some stunning coffee logo ideas. Ready-made online coffee store themes serve as a powerful starting point for conducting e-commerce activity. With their help, it is easy to create a professional website that presents your products and services, optimizes offline operation, and promotes sales growth. In case you want to tailor standard templates to your website, you can ask experienced developers for help. The finished website will run smoothly and quickly, rank well in search engines, and resonate with the target audience. 1. 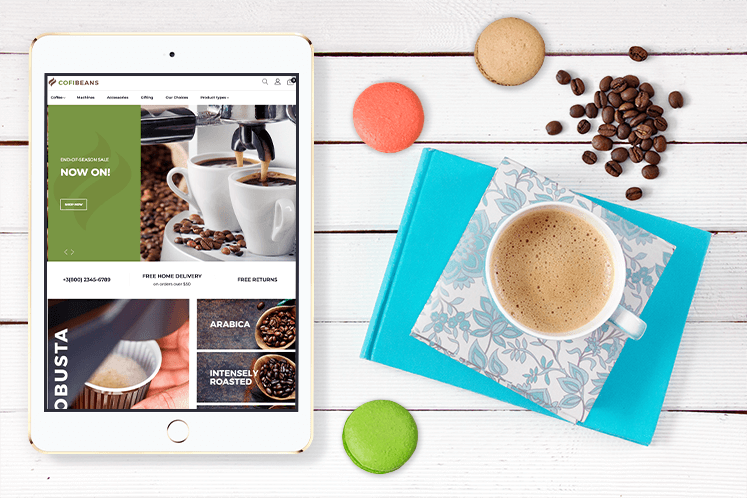 Cofibeans is a responsive Magento template for coffee e-stores. We can talk for hours about its bright and attractive design, but let’s focus on the extensions that go together. You have Megamenu with a clear division on categories, Newsletter Pop-up to catch more customers, Image Slider to demonstrate your products and hot deals, and Accelerated Mobile Pages with faster mobile pages loading to rank your website higher in Google – all of which are some of the extensions available. 2. 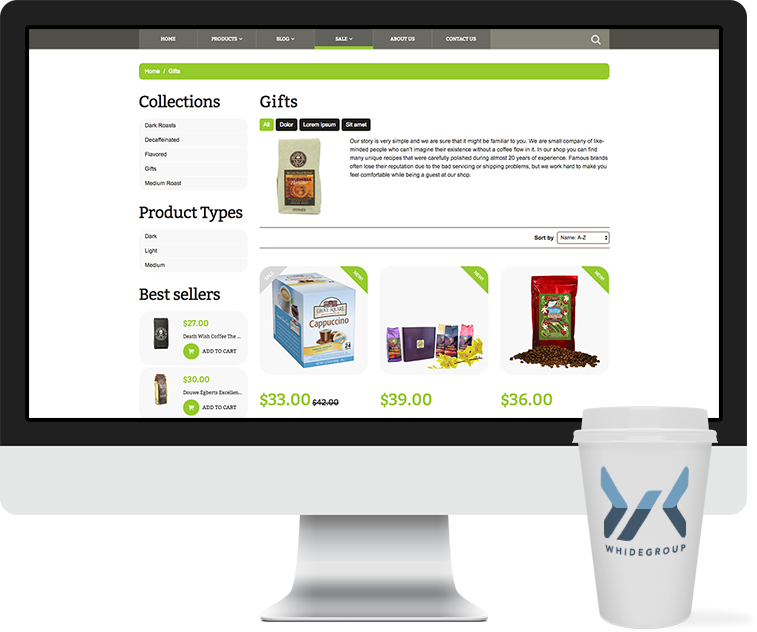 Our next favorite one is this Coffee Shop Magento theme. It has high user rates and positive reviews because of its extensive set of features and appealing design. The template is cross-browser, multilingual, and multicurrency, well documented, has a valid semantic code, and sliced PSD files. To mention its outstanding characteristics, the theme is provided with Product Badges to indicate the status and value of products, and a Cloud Zoom jQuery plugin to enlarge product pictures. 3. Coffee Store Shopify Theme is a good example of how you can display the high quality goodness of your coffee to your customers. Matching theme colors, a prominent logo on the header’s center, a well-functioning Parallax Effect, and incorporating a Lazy Load Effect are all perfect to meet this goal. Further, this theme has functional tools like Featured Products supplied with the “Sale” sticker and “Add to cart” button, and the search form built into the main menu bar. 4. 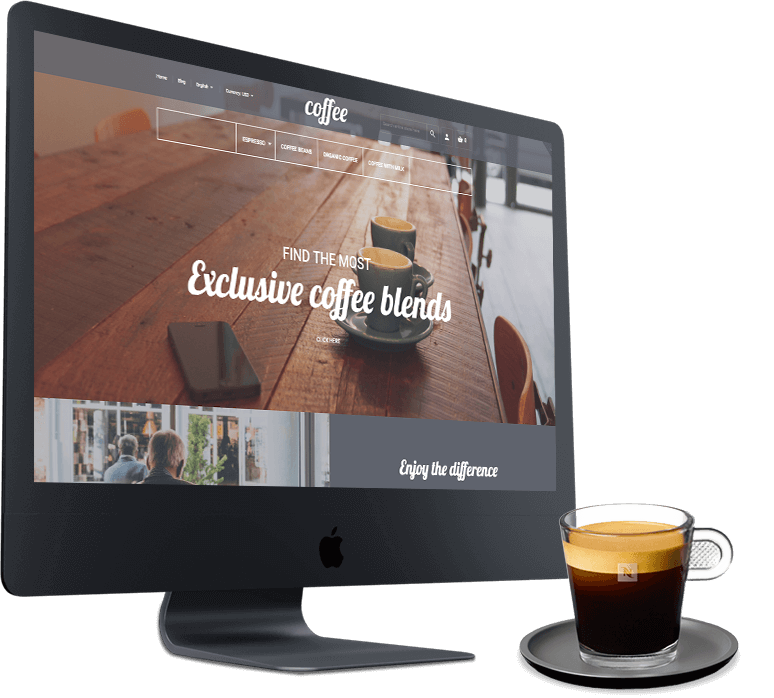 Coffee House & Shop closes our top-4 of templates for websites selling coffee and supplementary production. This WooCommerce theme is more affordable for its price and has an endless number of cool additional characteristics, such as two-step installation, Custom Widgets for comments and social sharing, a Built-in Theme Customizer and free updates. Ready to Build Your Online Coffee Store? 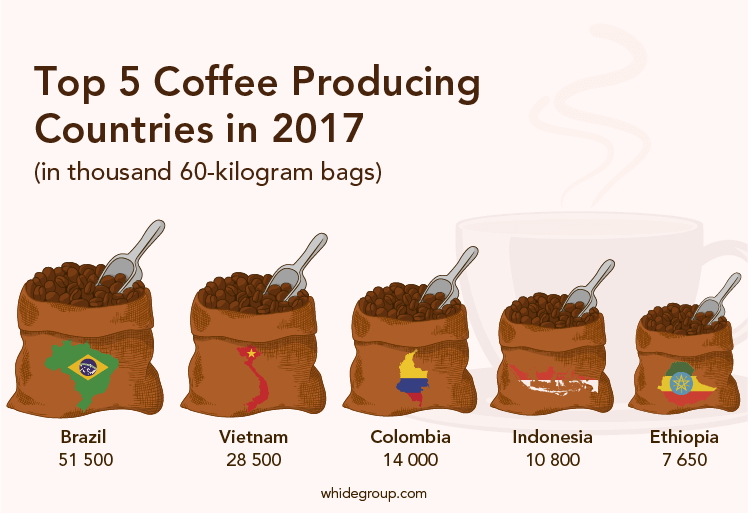 Coffee consumption is growing day by day, and market experts are expecting the global demand for coffee to grow by 25%, up to 175.8 million grain bags in the next five years. So, the time for you to launch your online coffee shop couldn’t be more perfect. Start your coffee business online to cash in. Use proven and reliable technologies like Magento, WooCommerce or Shopify, invest in high-quality coffee, and be attentive to you customers – these are simple but effective pieces of advice to help your store succeed.